A strong opposition results in a better Council. One that holds our high spend and tax Council to account to protect your hard-earned money. We will not merely complain from the side-lines, but rather we will challenge, scrutinise and propose alternatives. We will make Chorley Council focus on the issues that matter to you. At this election, the voters of Chorley won’t just be asked to decide the Council, they’ll be asked to decide the opposition too. Please lend Debra your vote in May. Debra highlighted the amount of monies spent subsidising the Flower Show by the Labour run Chorley Council. This is an excellent event which should pay for itself and not be heavily propped up by your Council tax payments to the tune of about 1% a year. Over the last four years the Labour administration has subsidised the show to the amount of £224,430. The Conservatives say, if the show runs then ‘increase the income and cut the costs and make the show work for everyone’. One of the top gripes from residents which we receive in feedbacks is about dog fouling. 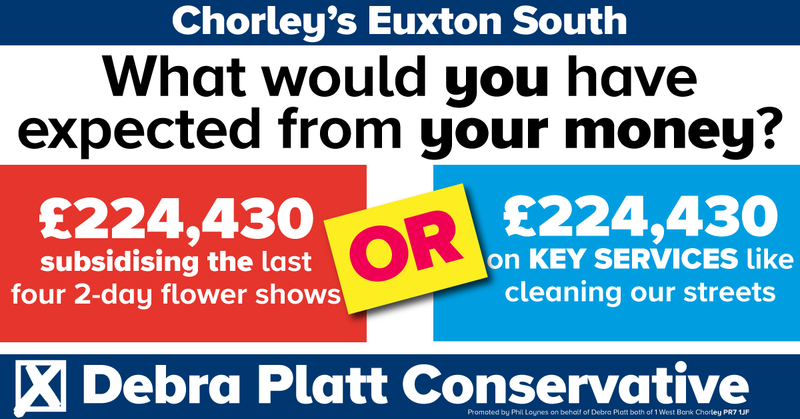 From requests made for information to Chorley Council the response revealed that of a total 1,713 reports in the Chorley constituency over the last 14 months, 216 were from Euxton alone, there have been no prosecutions – no one has been caught and given a ticket despite repeated reporting. Debra scrutinises and challenges the leading party to improve their budgeting, take better care of residents and their environment and, to make our council tax payments work better for us all.